Q is reporting outright panic among beltway Democrats over President Trump’s announced declassification of documents that DOJ and the FBI have refused to turn over to Congress, despite congressional subpoenas. They are refusing to turn over the docs on the grounds that they are “classified,” thus President Trump’s decision to declassify them with total redaction, save the most sensitive information. Clearly, the swamp rats are scurrying for cover. How important is it to them to keep the President from declassifying these docs? So important that they are willing to kill the sexual assault allegation against Brett Kavanaugh with no further interference or obstruction in return for the President not declassifying said docs. That’s how important keeping them secret is to the Democrats. Critically important! They will surrender the Supreme Court for decades to escape this one. Nothing doing! Q reports that President Trump has turned down that offer, asserting that Kavanaugh will be confirmed no matter the amount of Democrat obstruction, and he is right. The left is in very serious trouble. Felony trouble! Perpetually terrified Adam Schiff is looking even more panic-stricken than usual these days. His normal expression is that of a man who has found himself stuck in the middle of railroad tracks and can hear a train whistle approaching. 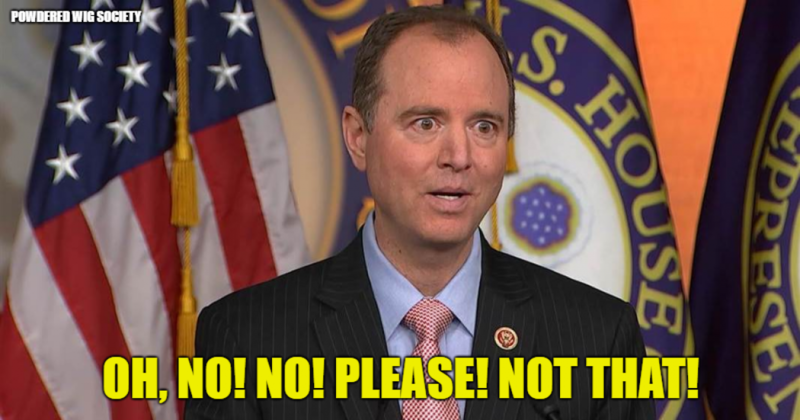 Today Schiff looks like a speeding train is ten feet away (photo, above). Q is also reporting that Loretta Lynch is spilling the beans. President Trump has ordered that numerous documents involving the Russia investigation be declassified. The records have long been sought by Congress under lawful subpoenas. Yet, the FBI and Department of Justice have consistently obstructed the release of these materials under the guise of “classified” secrets. This is a convenient alibi all too frequently employed to cover-up wrongdoing and abuse of authority by those we entrust to uphold the law. These days, overzealous government officials automatically designate nearly all matters as national security risks, regardless of whether they truly are. Whenever the FBI orders Chinese take-out, it is labeled “top secret” because… you know… it involves the Chinese. False classification has reached absurd proportions. In February, the Republican version of the House Intelligence Committee’s memo on the Russian investigation was also declassified. Once it was made public, we discovered that there was nothing therein that justified its suppression at the highest level of classification, “top secret.” Indeed, it should never have been classified at all. The FBI’s real objection was that it contained “material omissions” that made the bureau look bad. That is not a legitimate reason for originating or maintaining classification status, as noted by Washington Post columnist and Fox News contributor Marc A. Thiessen in a recent column. In fact, it is in direct violation of Executive Order 13526 that was signed by President Obama in 2009. Hiding lawlessness or embarrassment by government officials under the contrived protection of a “classified” designation is against the law. If the FBI, DOJ and others in the alphabet soup of government agencies had their way, none of their activities would ever be subject to scrutiny –even by members of Congress who have constitutional oversight responsibility. Americans would be kept in the dark about how unelected officials are wielding their immense power in ways that are not always fair and judicious. Sometimes, they are corrupt. A sane, decent and civilized democracy must never operate completely in the furtive shadows of concealment by its own government. The Constitution gives Congress the “implied powers” to hold executive branch officials accountable for their actions by lifting the veil of secrecy. This is the only way to prevent malfeasance and deceit. The Trump-Russian investigation is a case study in how personal and political bias motivated top officials at the FBI and Justice Department to misuse their authority to target Trump and to spy on his campaign in defiance of the rule of law. Nine months later, the FBI still had no evidence of “collusion” between Trump and Russia, according to a transcript of FBI lawyer Lisa Page’s recent closed-door deposition before Congress. This is corroborated by text messages she exchanged with her paramour, Peter Strzok, who served as the FBI’s lead investigator. Nevertheless, Robert Mueller was named special counsel despite a dearth of evidence. Under federal regulations governing his appointment, evidence of a suspected crime is a necessary predicate. It never happened. Instead, Mueller was granted broad authority to investigate matters that are not necessarily criminal at all. A special counsel is not authorized to search for a crime; there must be evidence of a crime first. This did not exist, rendering Mueller’s appointment illegitimate and invalid. The authorization order itself was defective inasmuch as it did not set forth the required “specific factual statement” of a defined crime. Despite their own admission that “collusion” was an unproven fiction, Strzok and Page traded text messages bragging about their “media leak strategy” with the DOJ designed to plant stories with reporters to damage Trump. Leaking classified information to the media is a crime. This is some of the most incriminating evidence yet that Obama’s Justice Department and Comey’s FBI were engaged in a deliberate scheme to use their government positions for illicit and illegal purposes to frame Trump. While Schiff is notorious for hyperbole, his assertion of a “red line” is rather stunning. Does it mean Rosenstein and Wray will defy the president’s direct order and continue to obstruct lawful subpoenas issued by congress? If so, they should be fired for rank insubordination. In the alternative, they may endeavor to delay or “slow roll” the release of documents hoping that the political winds may shift or that control of Congress itself will change hands in the upcoming election. Rosenstein has every reason to suppress the records. They may incriminate him. He affixed his signature to the final renewal of the FISA warrant application to continue spying on Carter Page. He vouched for the authenticity and veracity of the information contained therein. But if it was largely based on a “dossier” that was unverified and uncorroborated, Rosenstein may have been complicit in misusing his position of power in pursuit of a president who was wrongfully targeted by the FBI and DOJ. Either way, the future does not bode well for Rod Rosenstein. He appointed a special counsel without proper authority. He then refused to recuse himself as a key witness in the very case he oversees. All along the way, he has been obstructing Congress by withholding records they are entitled to have. He surely knows what the declassified documents portend for himself.